tPEMF is a non-invasive, FDA approved NPAID™ device (Non-Pharmaceutical Anti-Inflammatory Device) for the treatment and management of persistent pain and inflammatory conditions. Target Pulse Electromagnetic Field LOOP therapeutically helps repair your bulldog puppy injuries and can relieve the suffering of your senior bulldog’s arthritis and the pain associated w ith this condition. tPEMF, is a highly effective technology that can accelerate and improve your pet’s natural healing process. The Pulse Electromagnetic Field Loop is specifically configured to target the nitric oxide (NO) signaling pathway. Nitric Oxide modulate healing for humans , bulldogs and other breeds and pets. NO other PEMF signal has been purposefully configured in this manner. As a result, other Pulse Electromagnetic Field devices deliver LOWER doses to the nitric oxide pathway and CAN NOT reduce pain or inflammation as rapidly or effectively as the tPEMF-Loop. 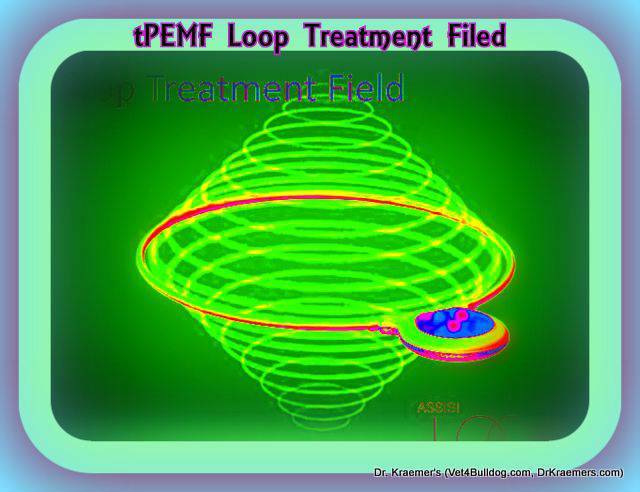 In Humans, Targeted Pulsed electromagnetic field (tPEMF) technologies have been useful as adjunctive therapy for the treatment of delayed union fractures, chronic wounds and post-operative pain including chronic wounds, pain and edema following plastic and reconstructive surgery and chronic inflammatory disorders. Research published in a December 2006 issue of The Journal of Hand Surgery demonstrated the effectiveness of Ivivi’s tPEMF treatment in pets. is also an effective adjunct to other in-clinic treatments such as Stem Cell Therapy, PRP, and Class 4 Cold Laser. the Targeted Pulse Electromagnetic Field Loop is a portable, affordable, easy to use, effective in-home treatment option for your bulldogs and other pets. CONVENIENT- Treats any body part directly, through dressings, casts, compression garments, etc. LIGHT- Very lightweight, comfortable applicators, easy to position and affix for therapy. BATTERY OPERATED- Light, simple, and battery operated. NO PREP- Requires no special preparation of treatment site. IN HOME USE-Easily administered by almost anyone at your own home. DEGENERATIVE DISORDERS: such as Osteoarthritis, hip dysplasia and elbow dysplasia as well as degenerative myelopathy. Osteoarthritis and DGD are a growing probl em in bulldogs and other dog breeds. There is existing evidence that Pulse Electromagnetic Field Therapy can benefit those patients and the underlying health of the cartilage. Studies suggest that use of PEMF can slow the progression of arthritis in bulldogs and other pets in the same pathway through which this PEMF technology decreases inflammation and enhances healing. WOUND CARE & HEALING IN BULLDOGS: The PEMF technology has been demonstrated to improve wound healing 58% more quickly than wounds which have not received Pulse Electromagnetic Field Therapy. PEMF technology may provide your bulldog and other pets with a safe non-invasive therapy that can enhance wound repair without the necessity of direct skin contact. PEMF therapy may be used to enhance wound repair in virtually all post-surgical cases. POST- SURGICAL HEALING, ANTI INFLAMMATORIES & PAIN RELIEF IN BULLDOGS and OTHER PETS: PEMF has been shown to have positive effects on both acute and chronic inflammation in pets. These results are comparable or superior to NSAIDs, without the potential for side-effects. PEMF helps your bulldog and other wounded pets heal faster by accelerating the natural anti-inflammatory cascade non-invasively and without drugs. The PEMF devices have been used to treat arthritis, tendonitis, laminitis and other known inflammatory conditions. *Note: this technology is proven in laboratory experiments with results published in peer-reviewed journals with demonstrated effect on the known biochemical and cellular mechanisms of action related to inflammation. *Note: In a study on humans, the Ivivi Inc. PEMF device reduced the use of pain medication by nearly 3-fold in the treated patients compared with the control group. It has also been demonstrated to provide pain relief in human osteoarthritis of the knee. LIGHT & SMALL: targeted Pulsed Electromagnetic Field (tPEMF™) device weighing about two ounces and with a 7.5 inch applicator. START: Treatment begins by simply placing the applicator over the treatment site and pressing the start button. PROGRAMED: The Assisi Portable™ Automatic offers A 100 Treatments each 15-minute duration treatments every 2 hours. To get 100 treatments from your Assisi Portable, please wait at least 2 hours between treatments. Treating more frequently will reduce the number of treatments from the device. Note: Batteries are inside the sealed case that houses the programmed signal generator. They are not replaceable.